Organizations in the consumer packaged goods (CPG) industry are discovering that high product volume sales come at the expense of extreme data complexity. Meanwhile, these companies struggle to maintain open lines of communication with their retail customers and distributors in order to manage the upstream flow of product. These issues are not specific to the IT department: line-of-business managers in marketing, sales, manufacturing, and procurement, among others, must derive tangible business value from this quagmire of data and generate a healthy flow of information throughout the value chain. Many CPG organizations confronting these challenges gravitate towards business intelligence (BI) tools to create such supply chain links and deliver product more efficiently. 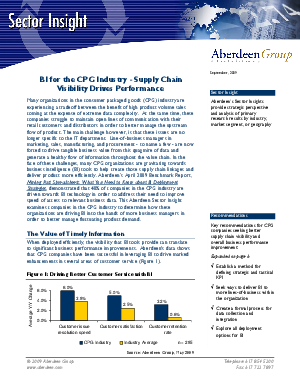 This Aberdeen Sector Insight determines how companies in the CPG industry deliver BI to business managers so as to better manage fluctuating product demand.